Starting off this series where I’ll be highlighting warlocks throughout the Warcraft Community we’re going to meet Hasteur. For those of you who might not know, Hasteur is one of the hosts of the Group Quest podcast and he is also the creator of the warlock Fel-Tron segments. I was honored to have Hasteur and his team invite me onto the Group Quest show this past Sunday to join him, Gulvan, and DeGei for a roundtable discussion on current topics about the game, and I had a great time despite some audio issues Skype and my computer decided to toss at me. If you like, you can hear the full episode at this link called Not Another Warlock. I have a lot of respect for Hasteur because he’s very passionate about our wonderful warlock class. You may recognize his guild name too because Hasteur is a guildy with Stompalina and Halfrot from the Rawrcast podcast. Pretty cool, huh? What’s your favorite spell and why? Metamorphosis, as the signature ability of the the spec. Having the ability you bounce in/out of the form depending on what I have going on around me (Big AOE pulse, Prime damage event, etc). Do you prefer using a minion or using the Grimoire of Sacrifice? Minion! As Demo, the best choice is Grimoire of Service because your output (and minion’s output) is directly buffed by mastery. Which is your favorite demon to command and why? Felguard, I randomized his name a couple times and got a name that was partially the name of a PVP rogue who used to play on the same server as me. I met him once at a Blizzcon so I have that special feeling that when I send the felguard into battle it’s the rogue who’s doing the damage. What flavor are your warlock cookies (examples: Chocolate Chip, Carmel, Salty QQ Mage Tears, Spicy Hawtness)? Tears from the encapsulated souls of (Stormwind/Ogrimmar) orphans. What is your favorite dungeon or PvP battleground and why? Can I go with None of the above? I used to be big into PVP in BC, but I joined a raiding team and didn’t have the time to learn all the new battlegrounds and their metagame strategies so I stopped doing PVP. I’ll occasionally do it when it’s part of something else (Legendary quest line, Children’s Week, etc) but not willingly. Who is your favorite raid boss and why? Currator in Karazhan. 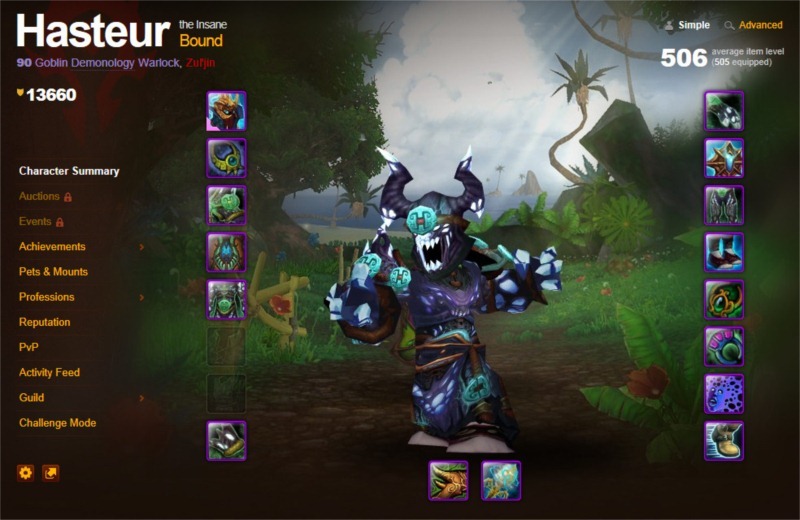 When I first started being a PUG raider, I got into a weekly Karazhan raid and I was fairly decked in PVP gear at the time so was a natural choice for the Currator offtank (as I had almost as much HP as the plate tank). Do you have any tips you can offer for newer warlock players, or to those who are new to your specialization? Be Evil! How can readers get in touch with you? http://fel-tron.com show@fel-tron.com or @hasteur on twitter. Thanks Amijade. I look forward to reading about more warlocks out there.. I’m adding Hasteur’s blog to my lock list. Replace some of the recent lock bloggers that have dropped offline. I always learn something new whenever I read this blog. Great post!